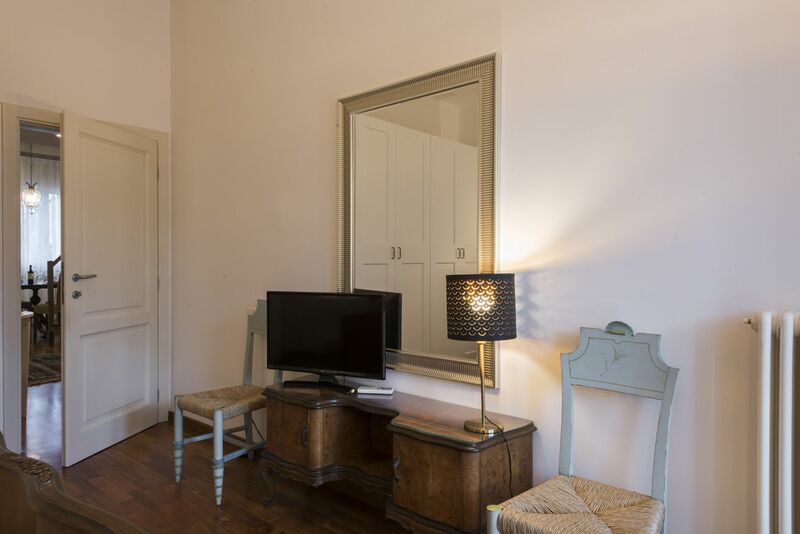 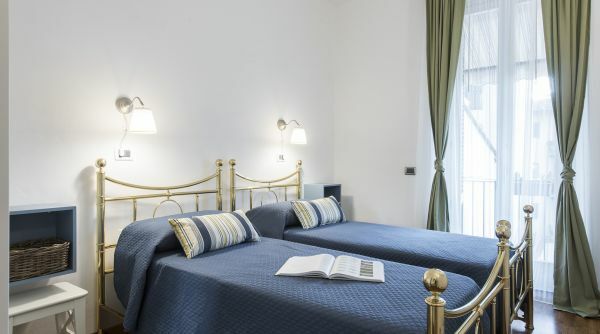 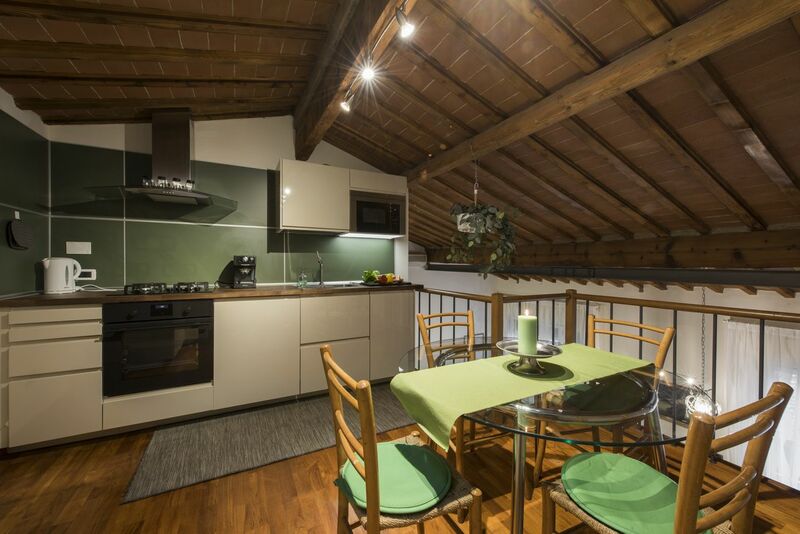 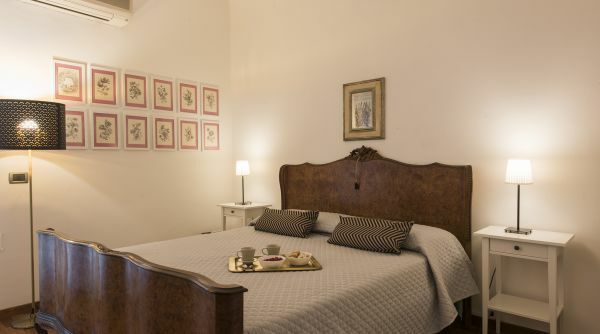 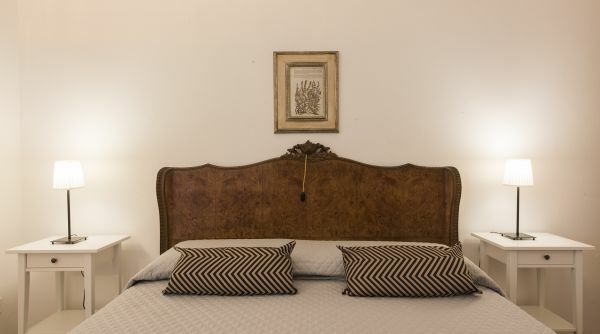 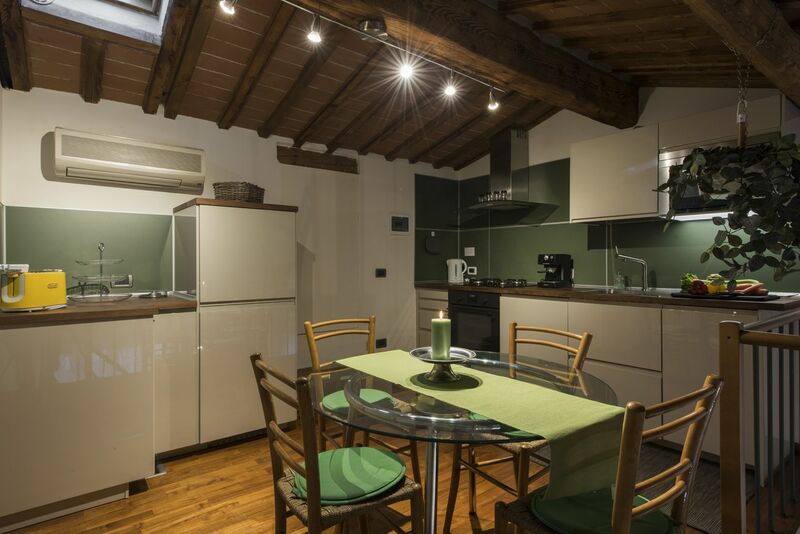 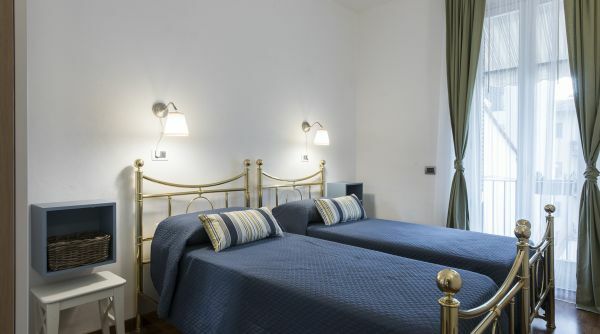 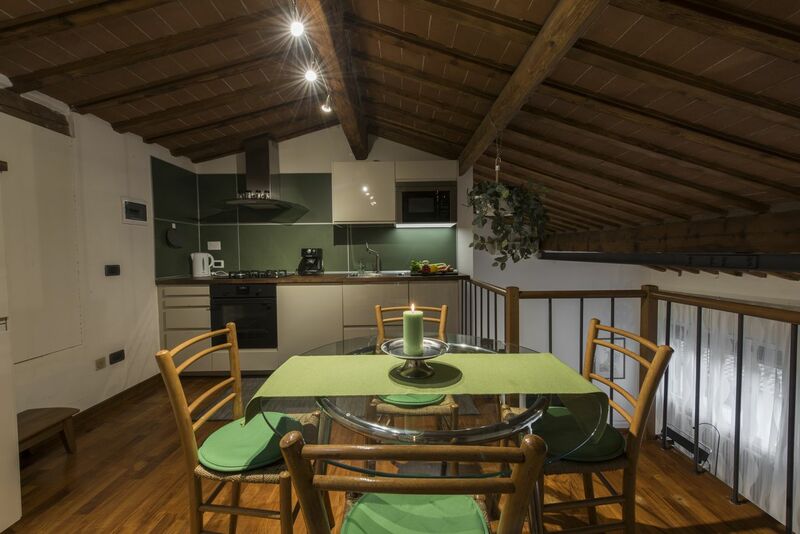 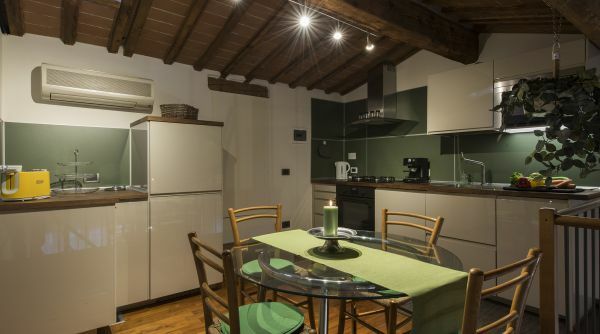 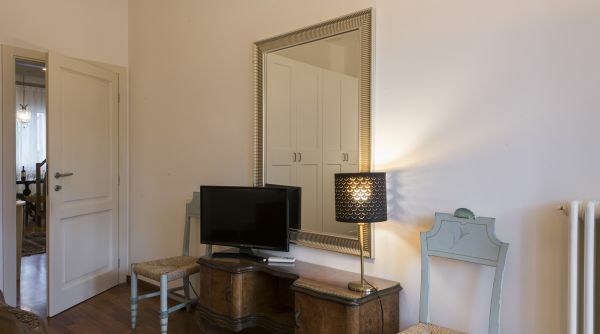 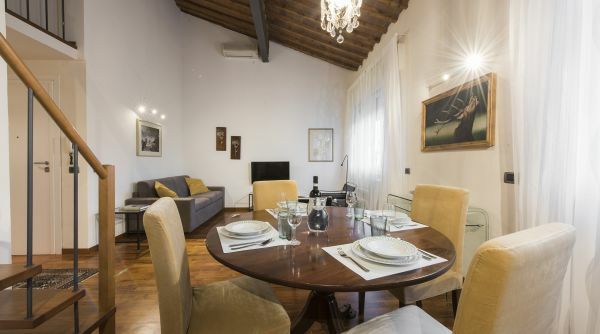 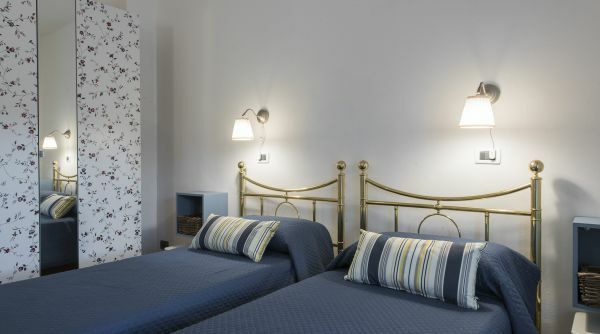 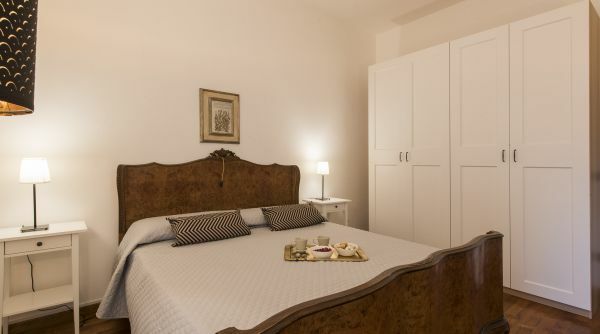 Wonderful 2 bedroom apartment in a less touristy area of Florence but very close to all the main attraction. 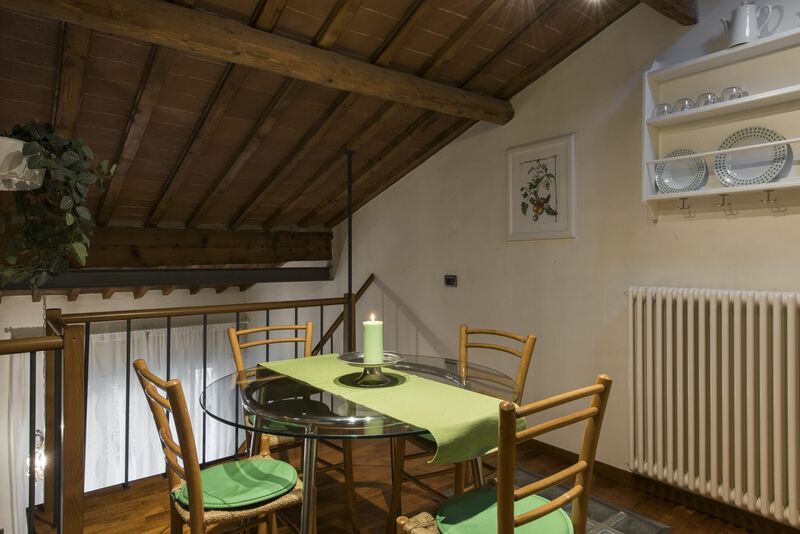 The apartment has great views of the hills around Florence and a lovely balcony that faced the open inner courtyards at the back. 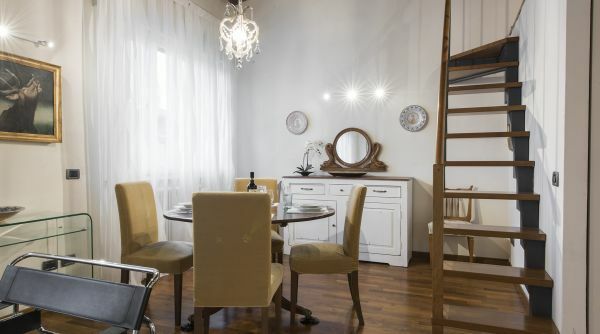 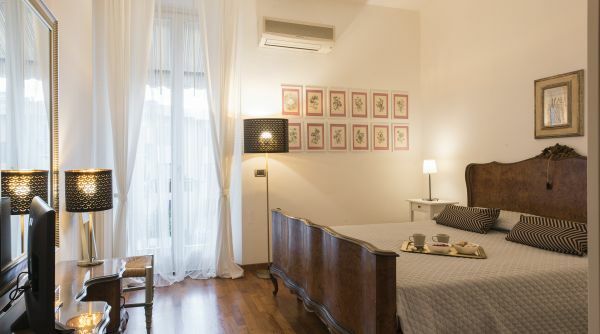 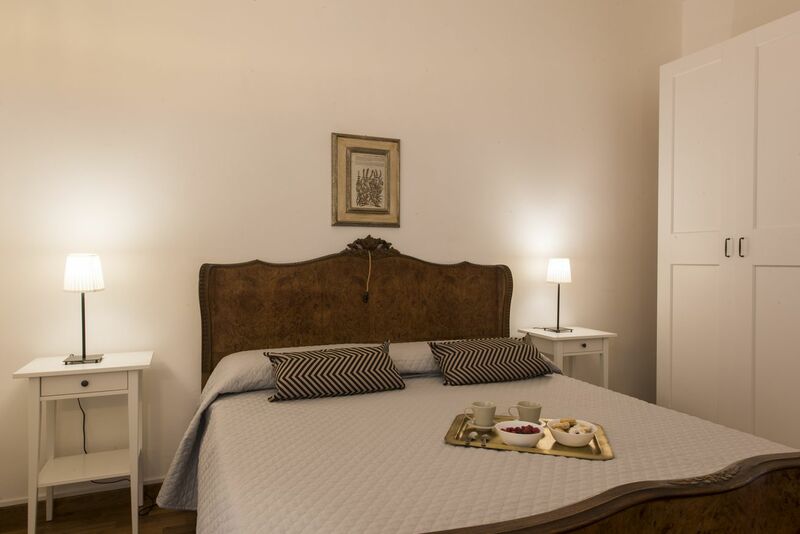 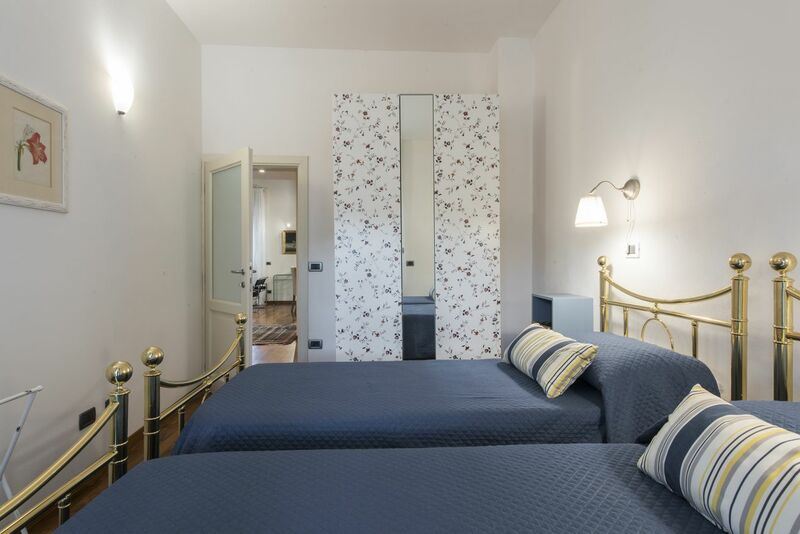 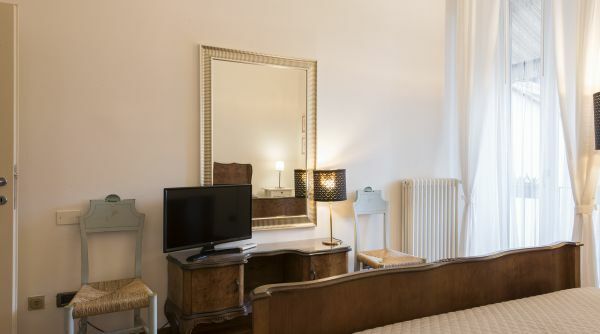 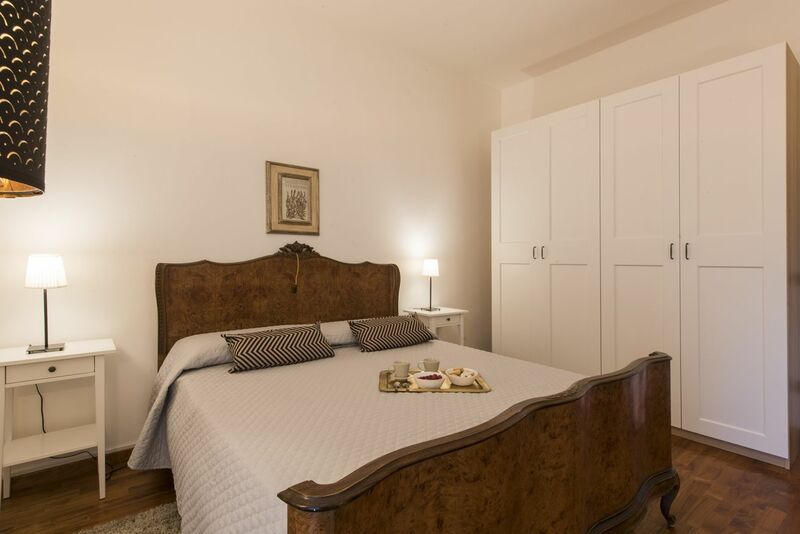 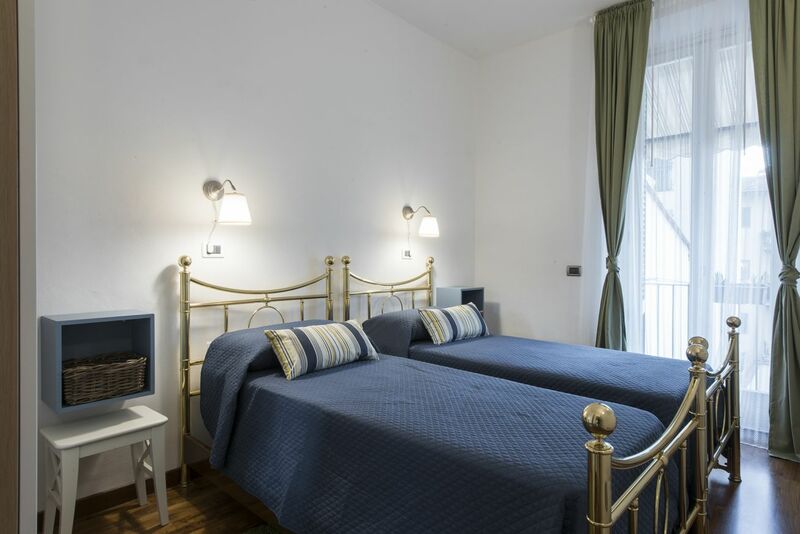 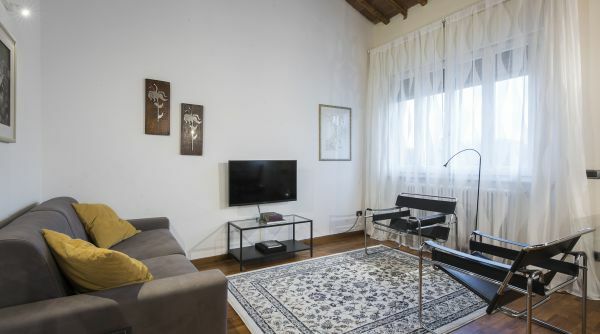 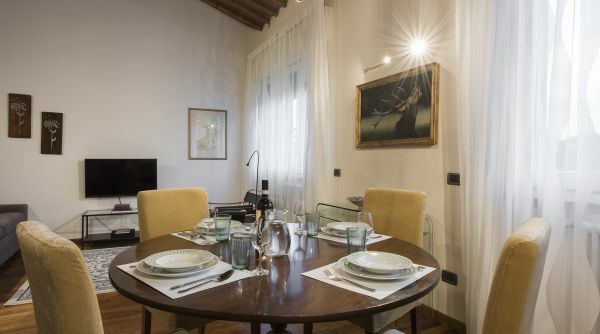 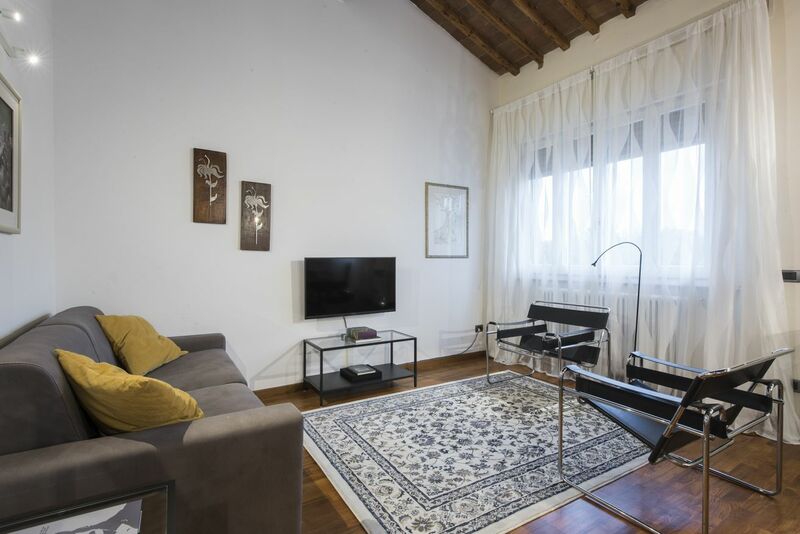 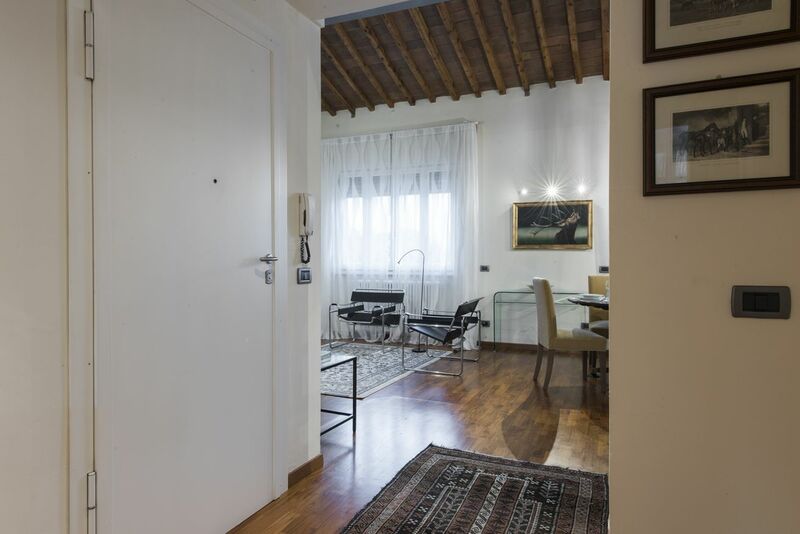 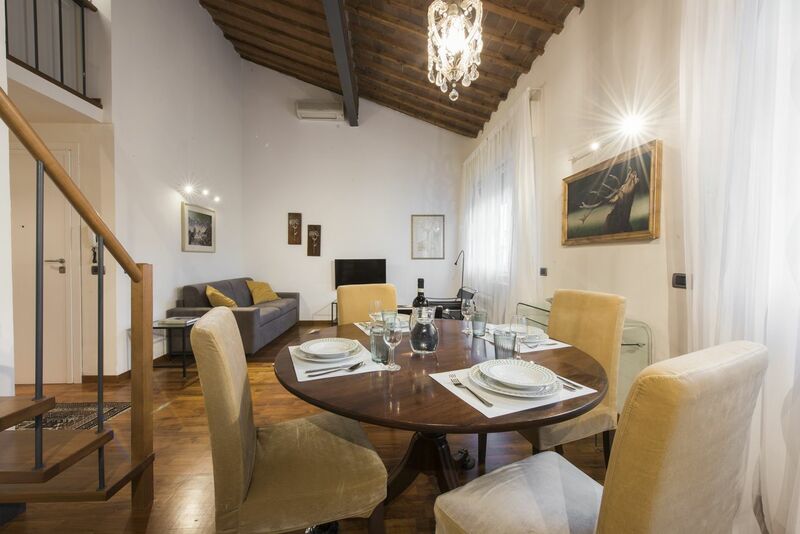 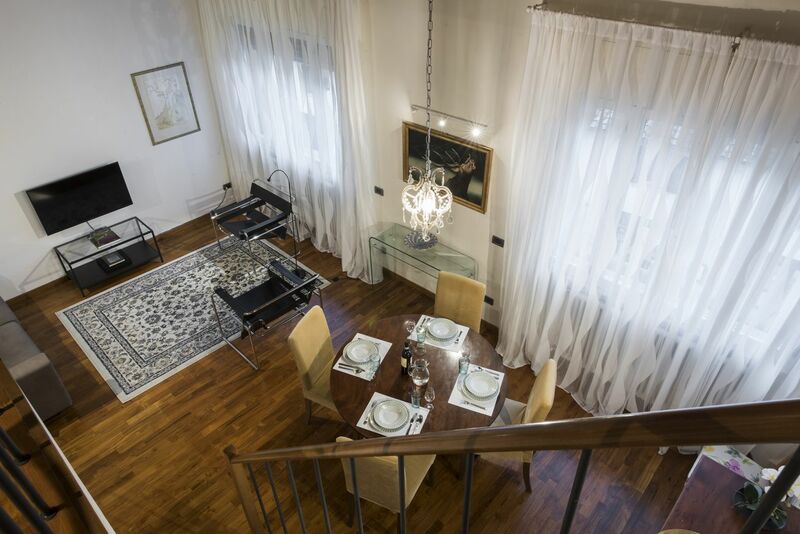 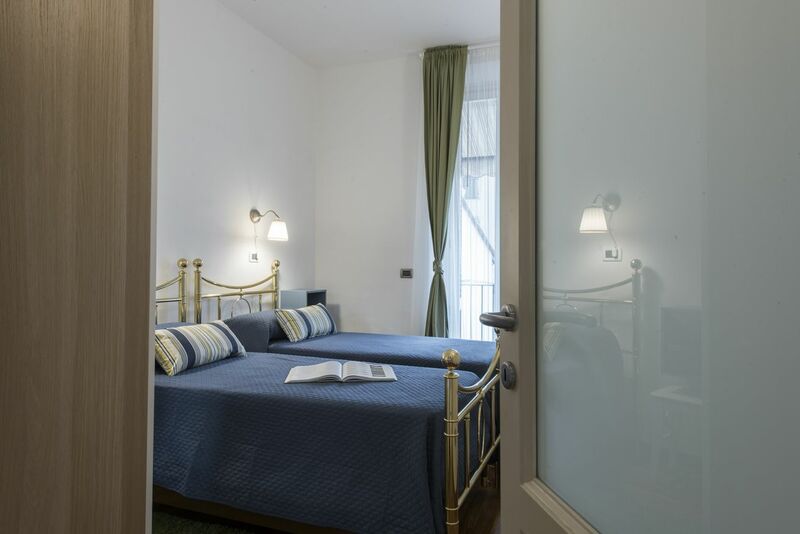 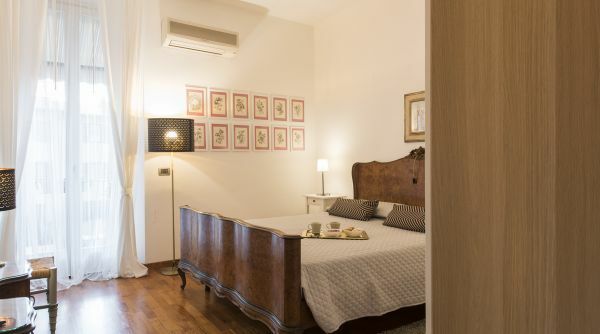 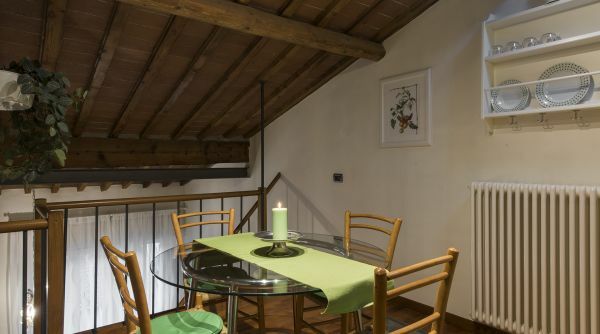 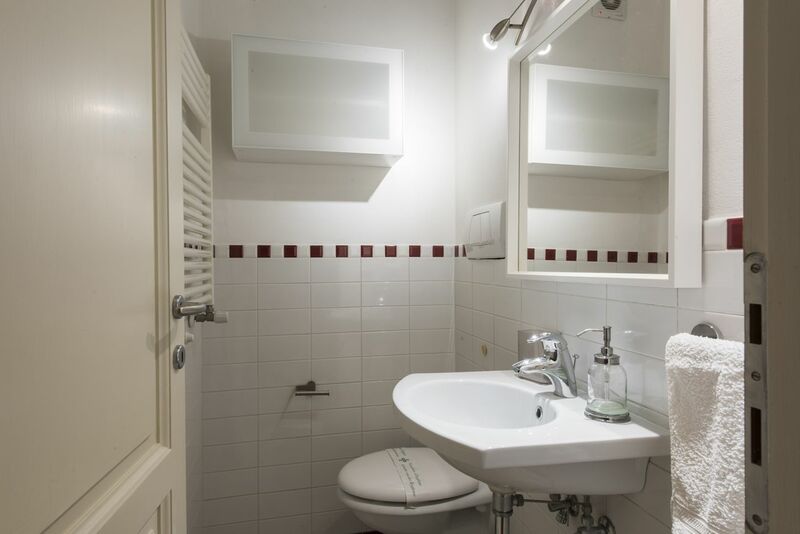 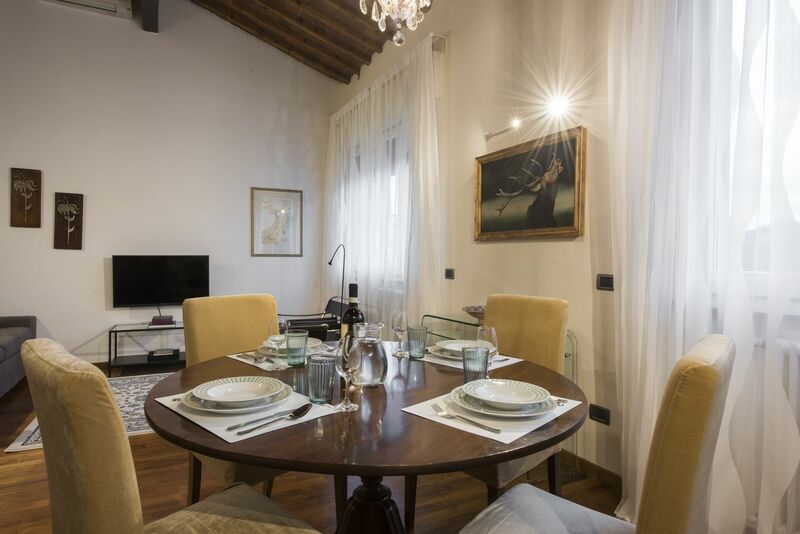 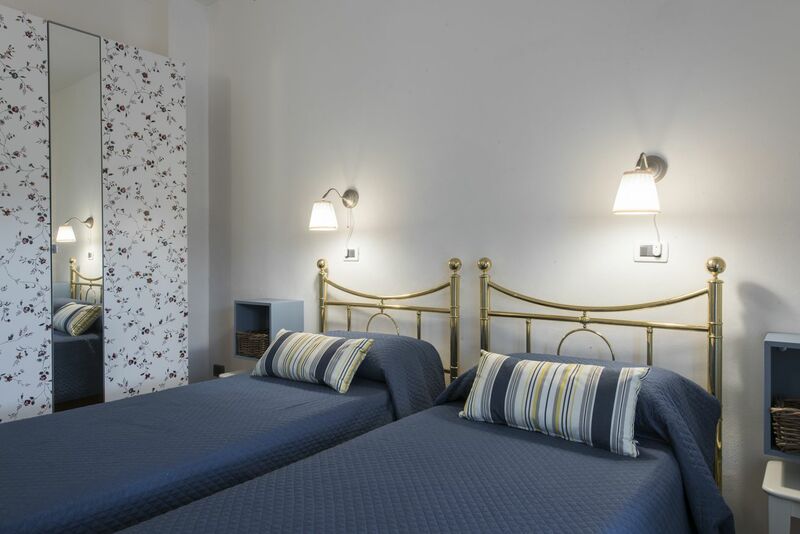 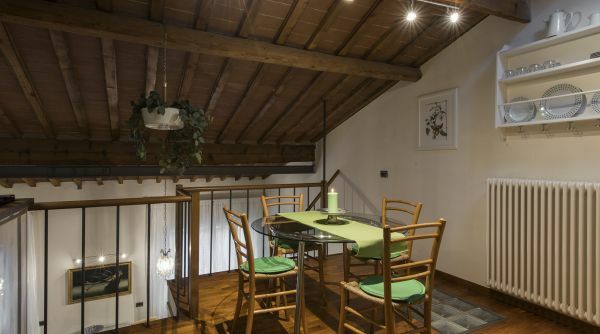 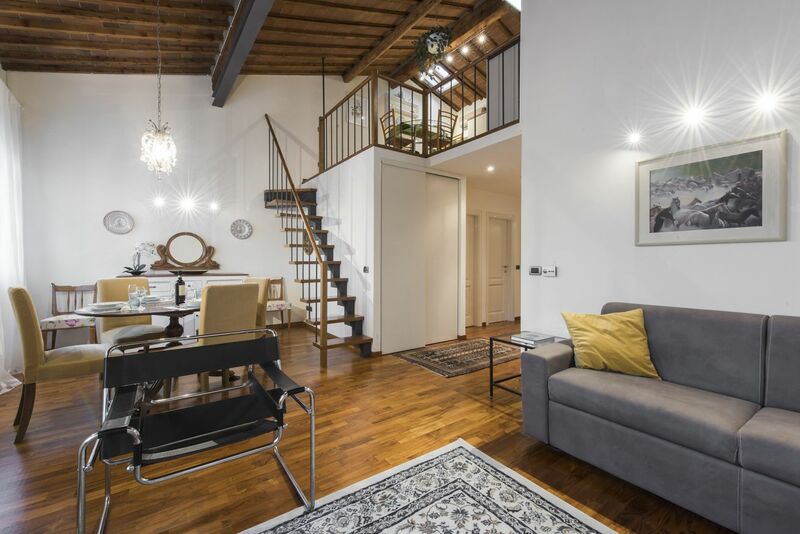 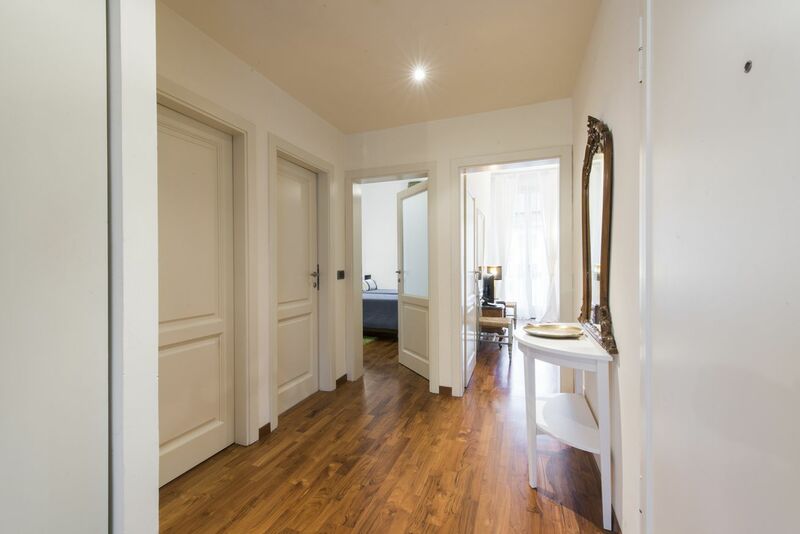 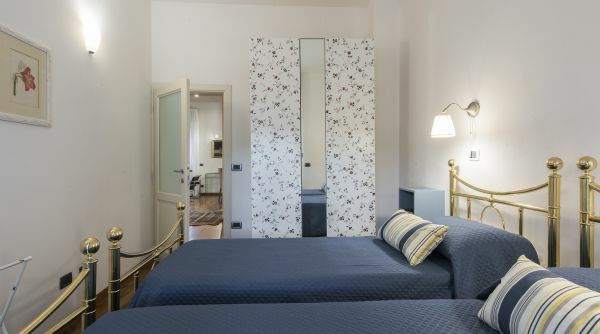 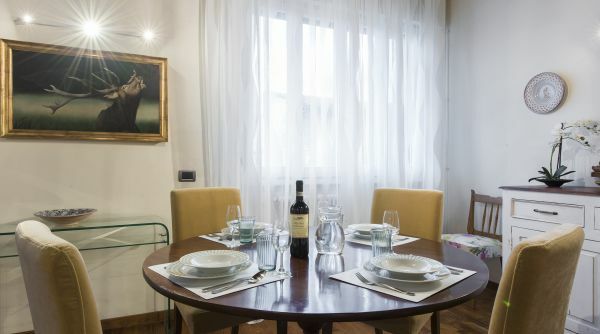 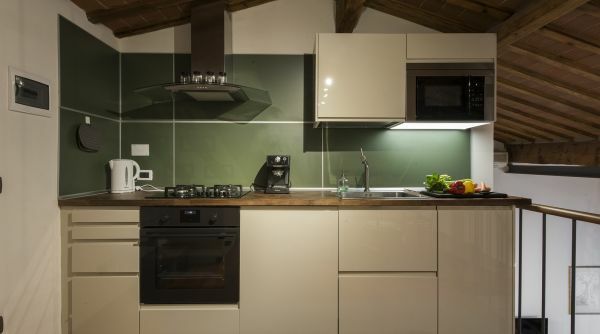 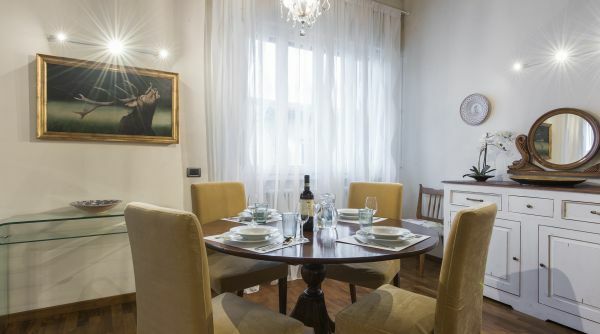 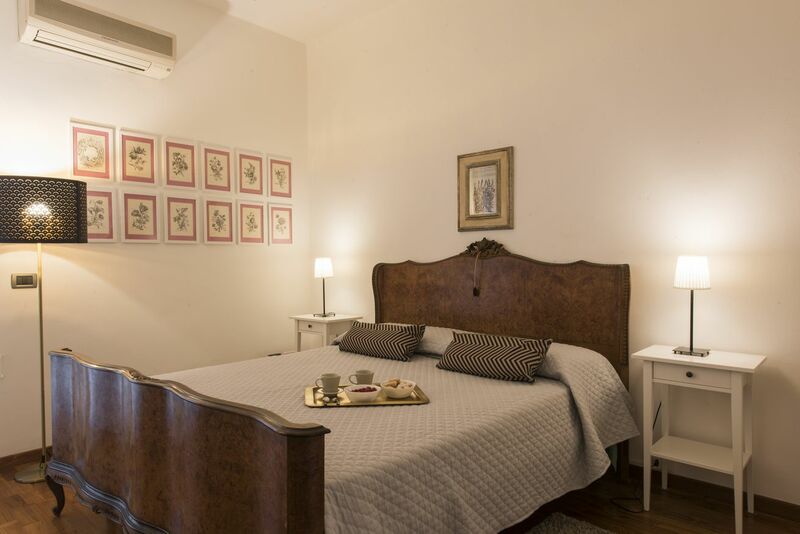 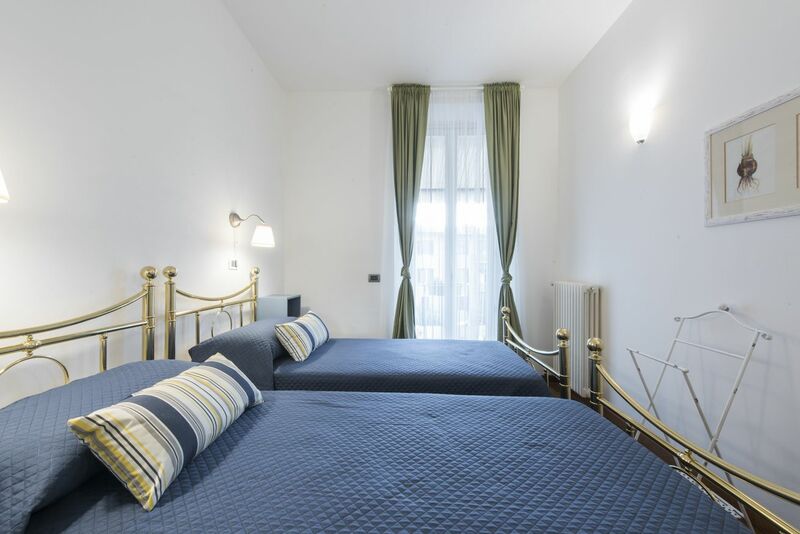 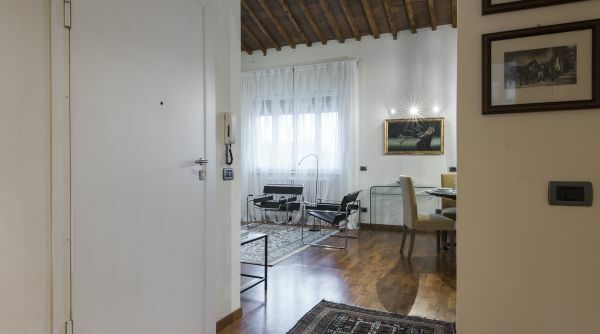 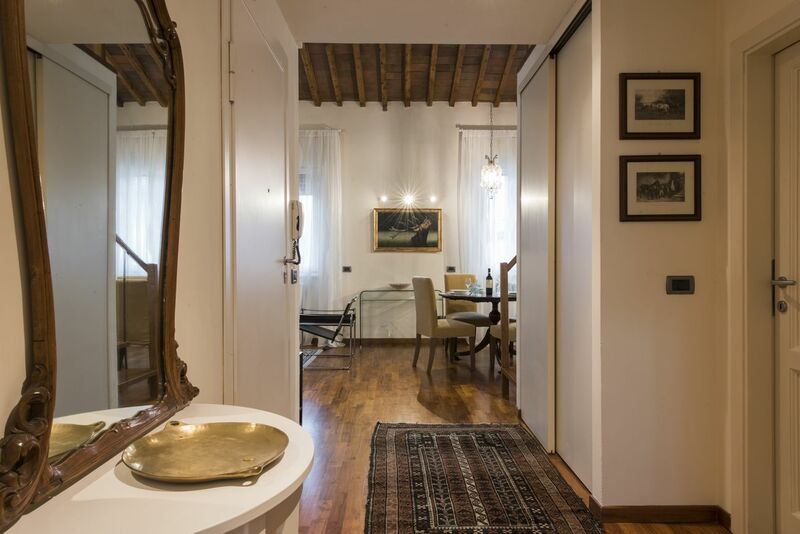 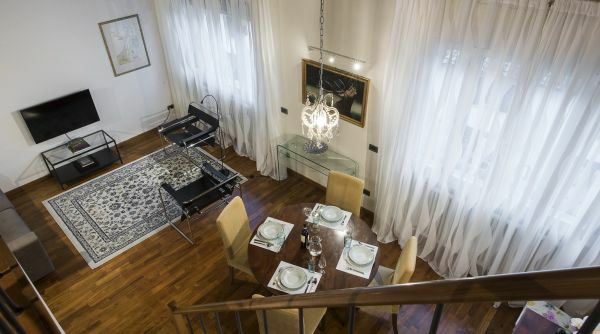 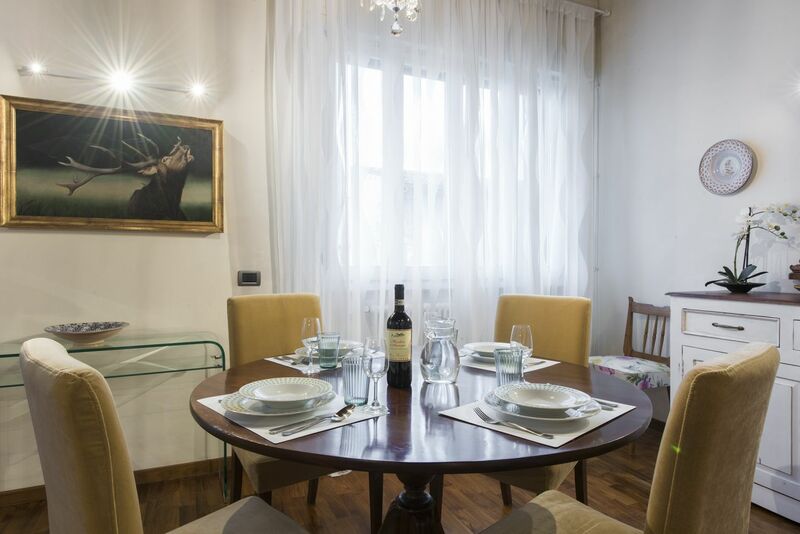 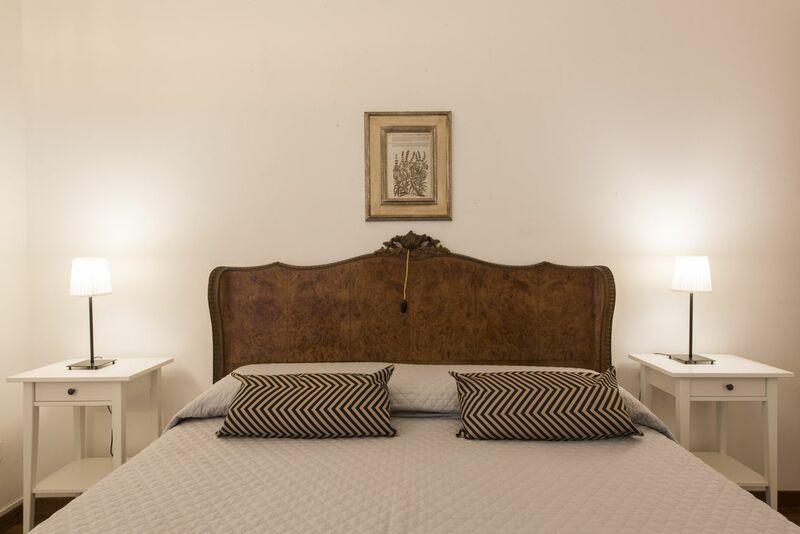 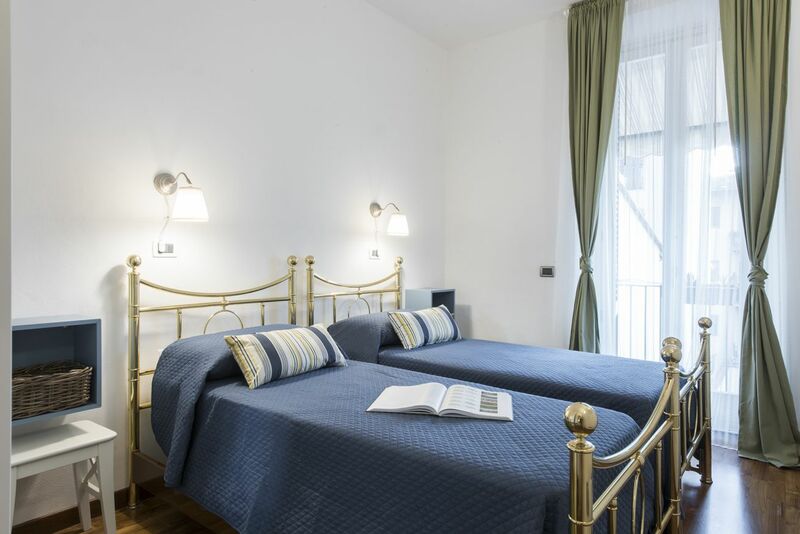 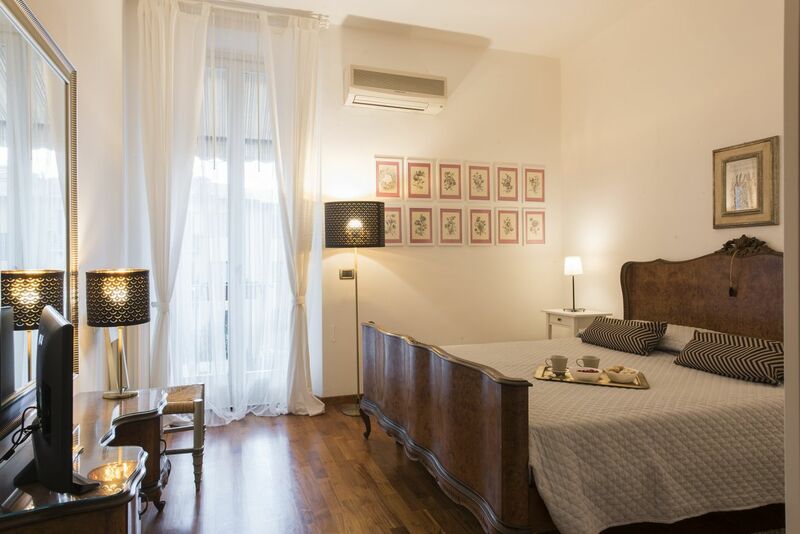 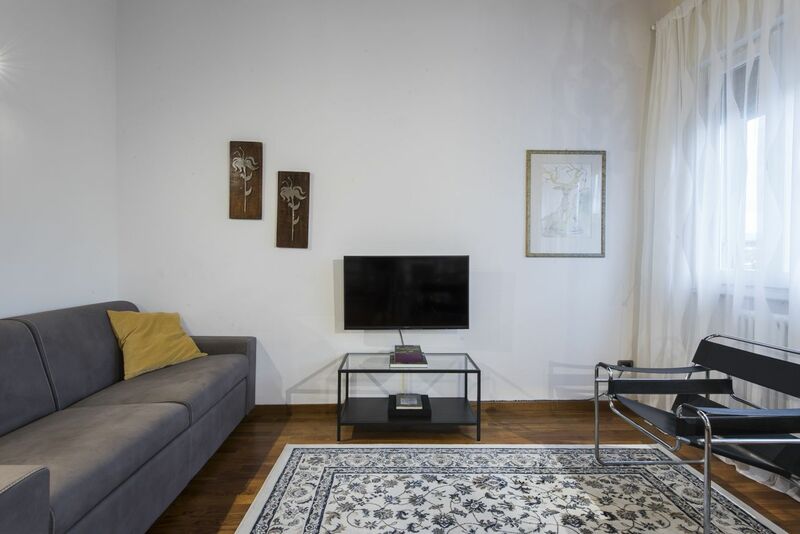 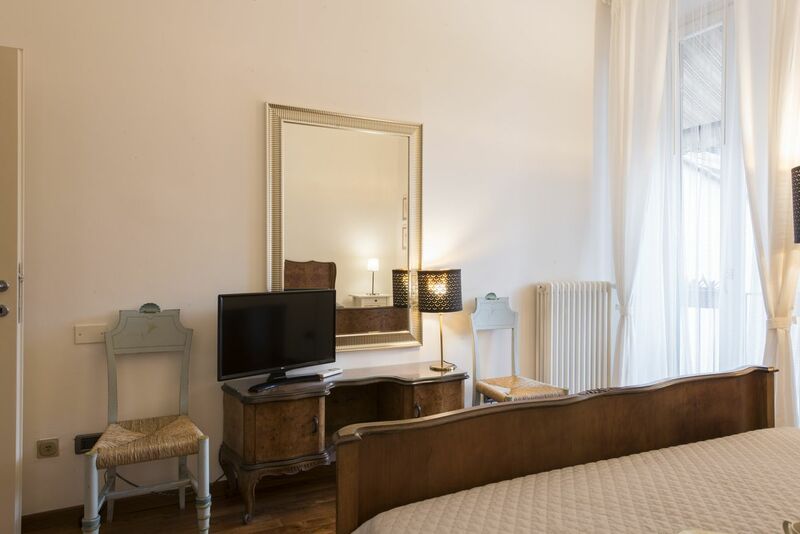 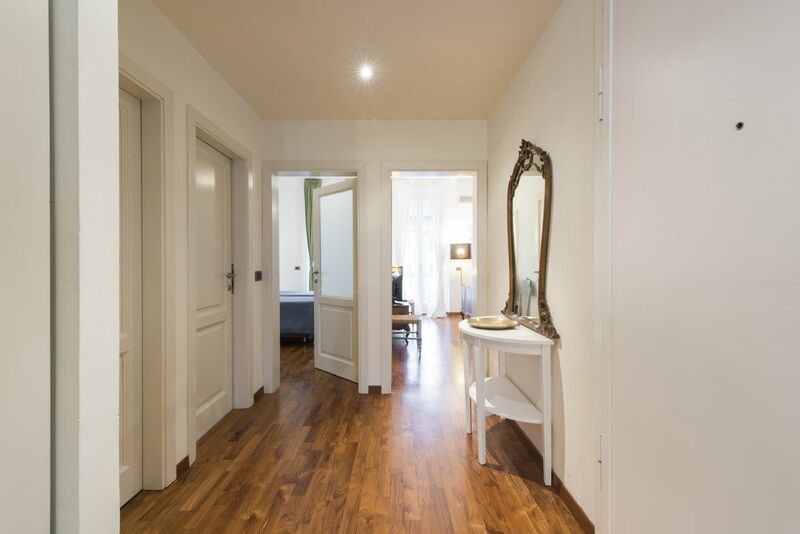 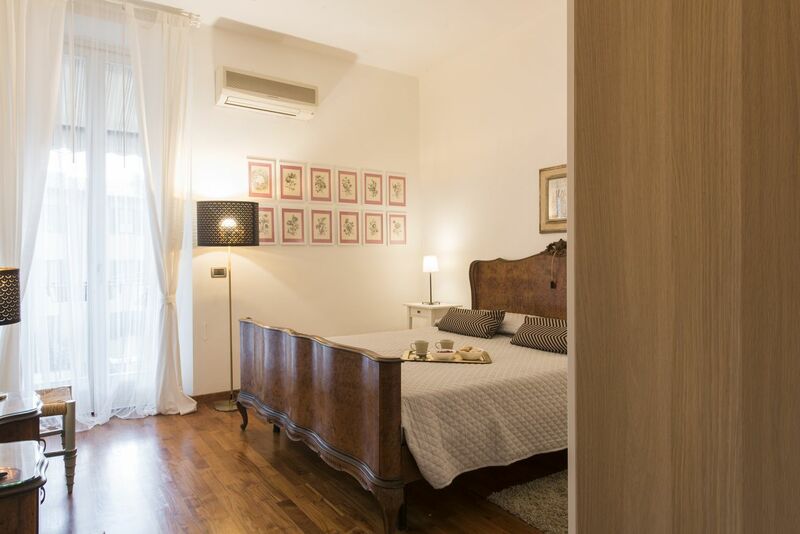 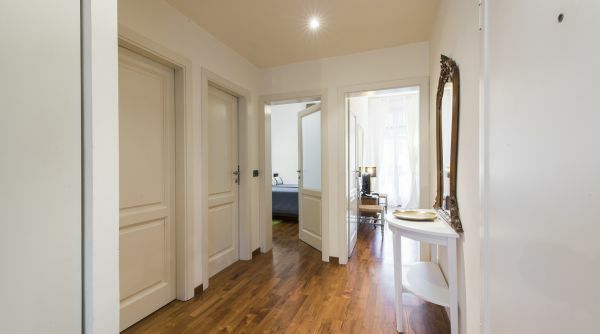 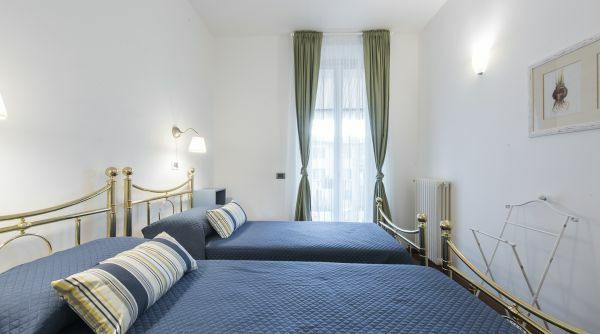 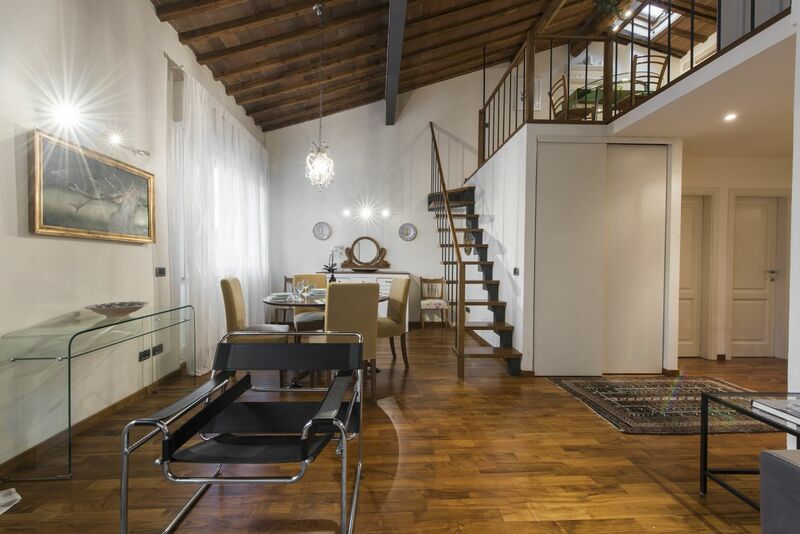 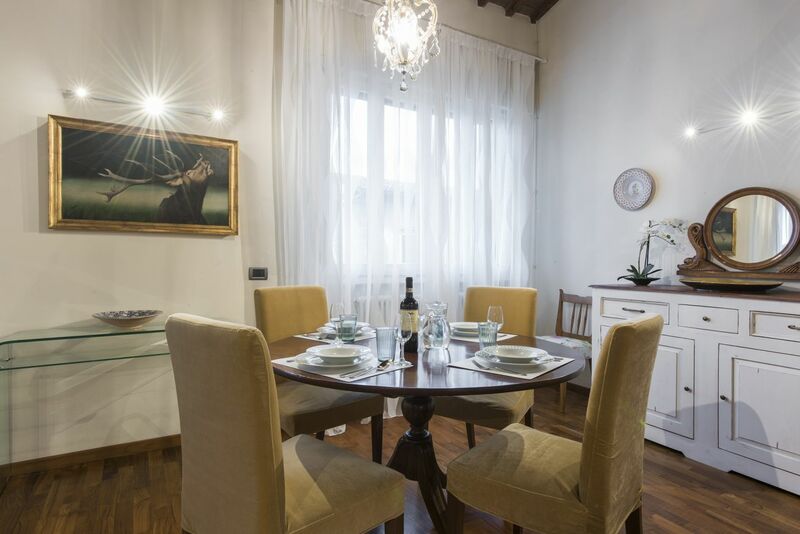 This apartment is located on the third floor of its building on a main road that is just a short walk from Santa Maria Novella. 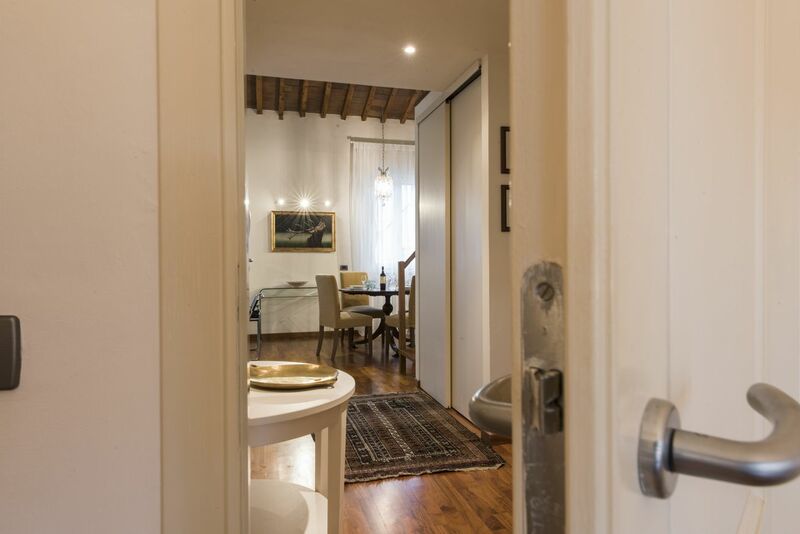 Its location allows guests for a more local view of the city, while still keeping them close to the best shops and restaurants that downtown Florence has to offer. 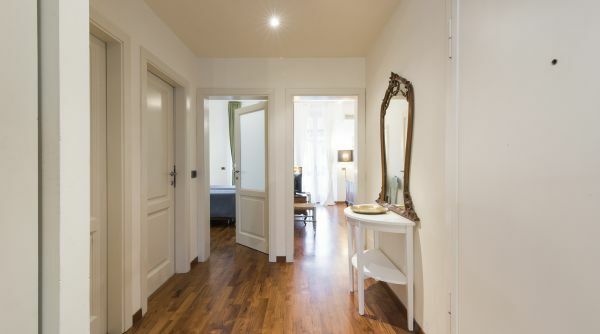 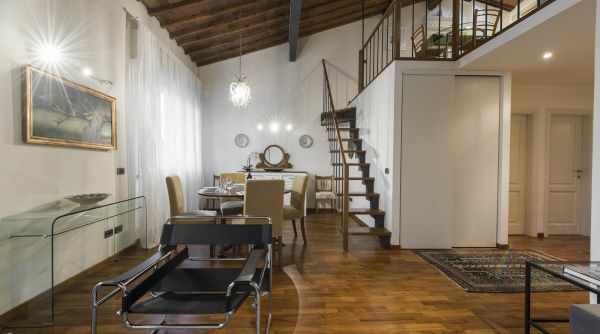 The apartment itself mixes modern and traditional pieces to create a unique look for each room. 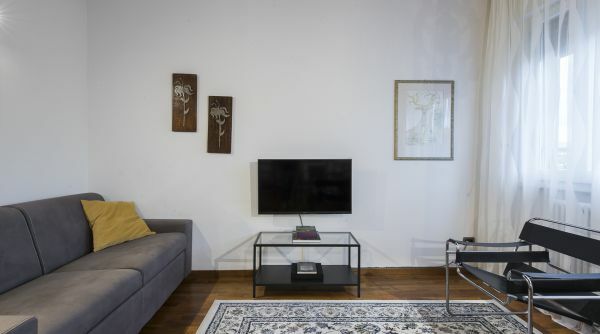 The living area is cozy and modern with a comfortable couch, a flat screen TV, and pops of details throughout, in the same space you will find a round dining table that sits comfortably 4 guests. 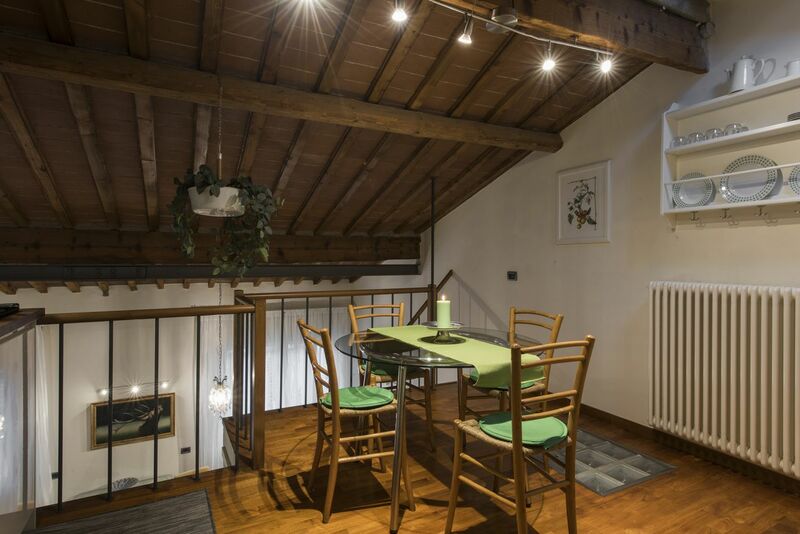 The fully equipped and modern kitchen is located on a mezzanine adding a quirky and fun feature to the whole space. 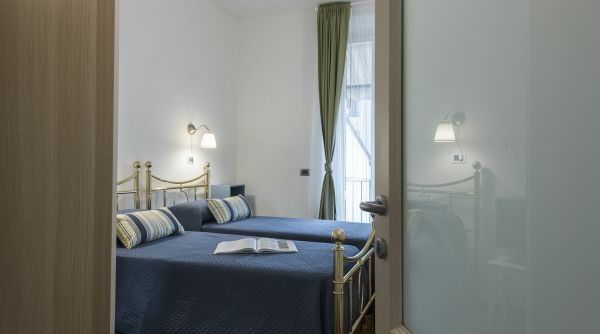 The apartment has two bedrooms, next to one another and both have access to the balcony, so they have lots of natural light coming through the glass doors. 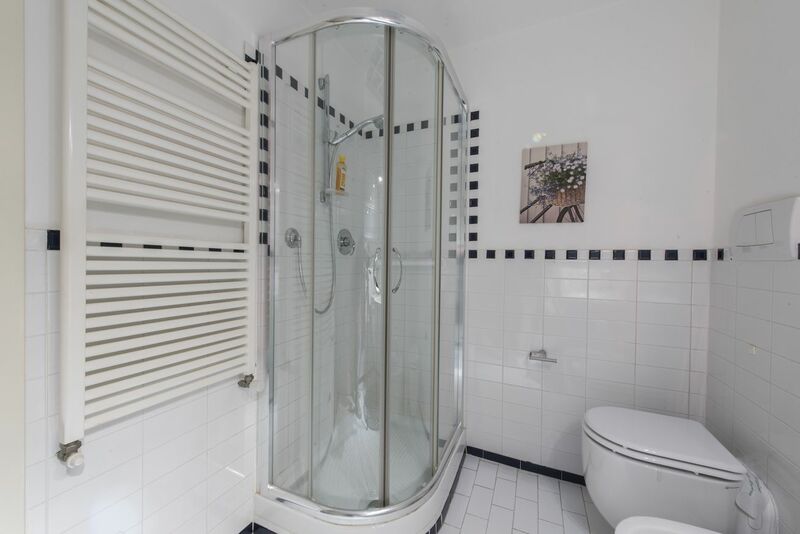 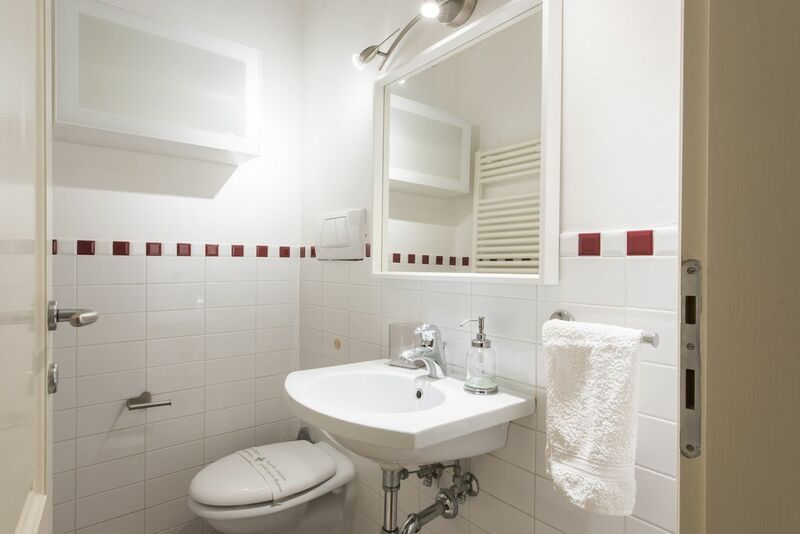 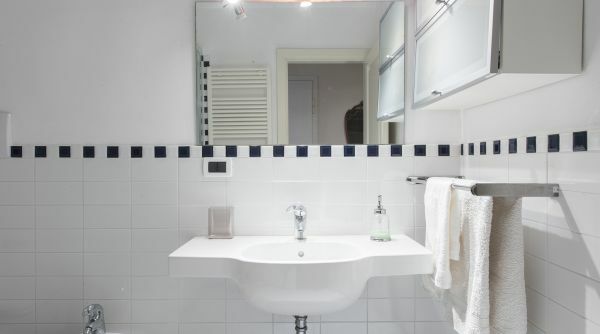 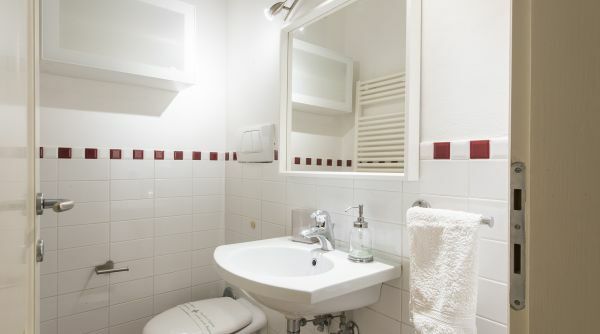 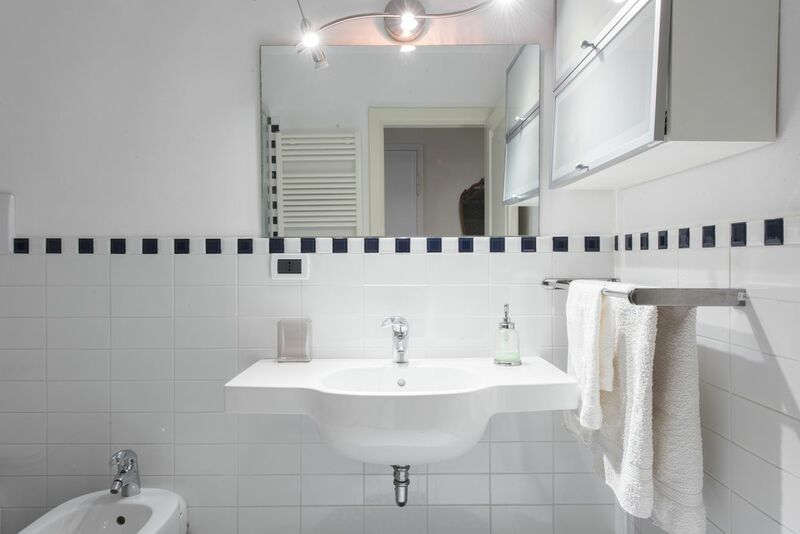 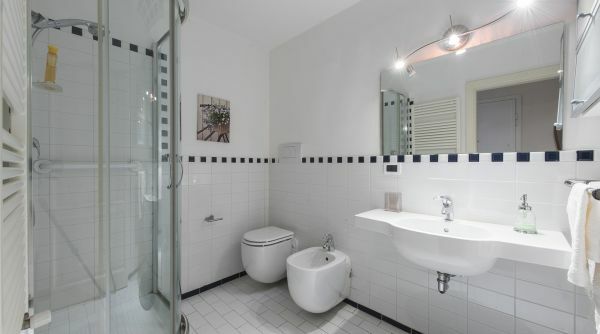 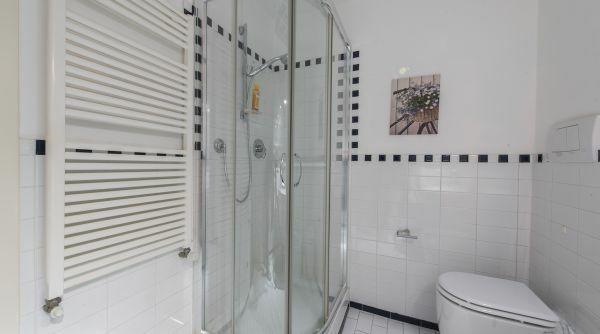 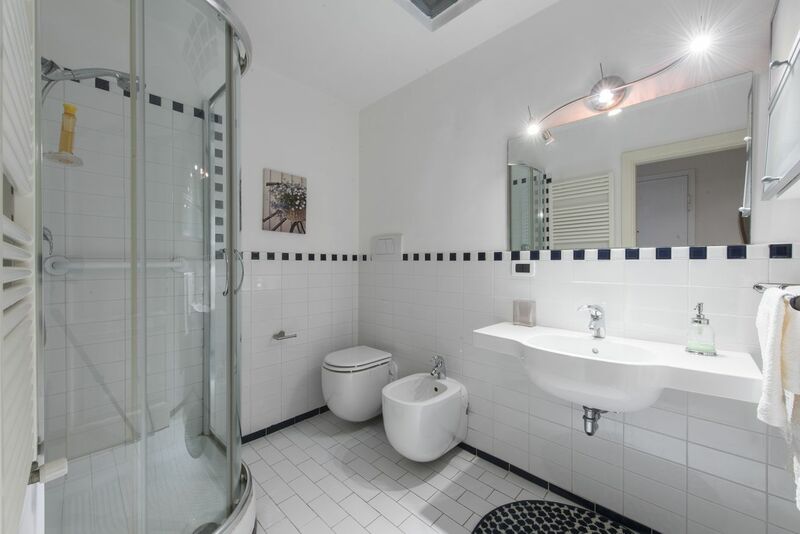 There are two bathrooms, one full bathroom, equipped with shower, and a half bathroom ideal for guests. 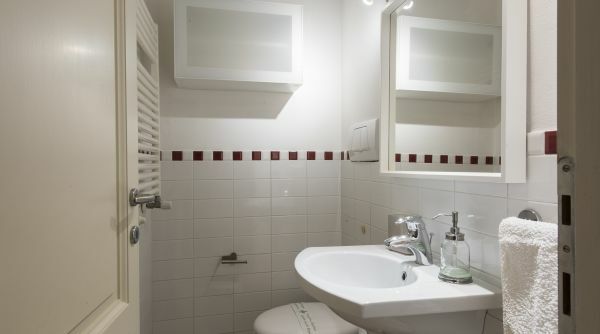 The apartment also benefits from extra amenities, such as a washer, air conditioning, and a dishwasher. 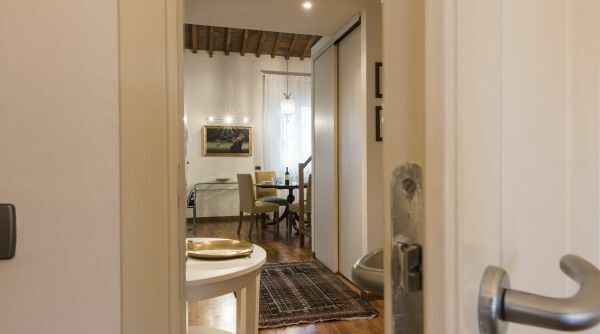 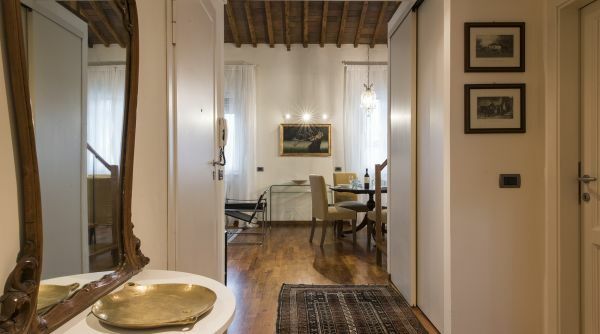 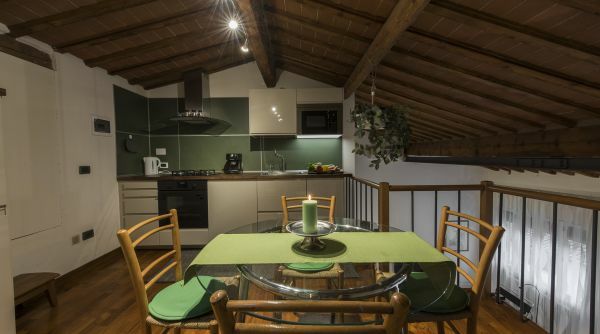 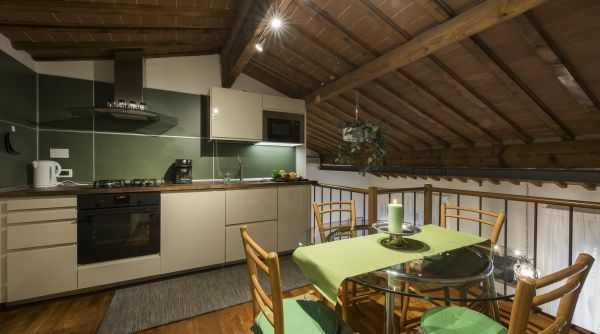 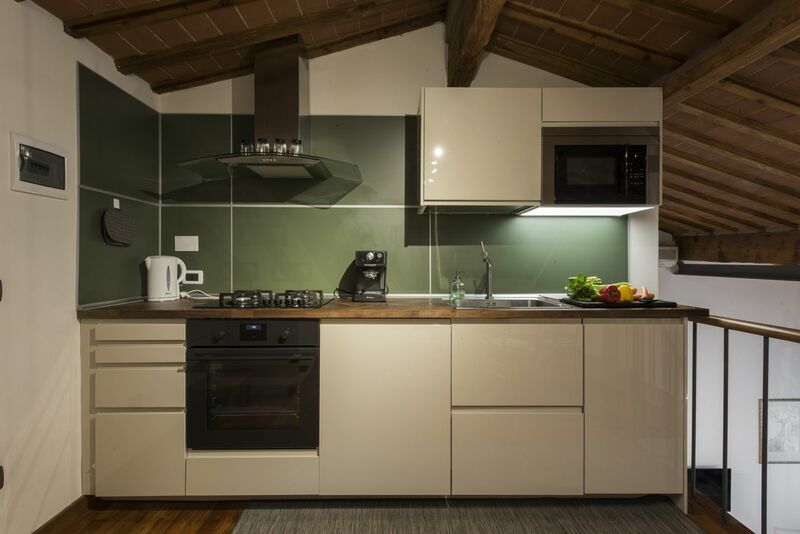 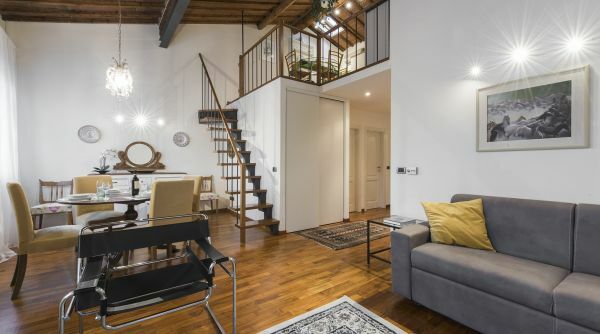 The location and design of this apartment makes it perfect for a group of travelers who are seeking a more authentic and more relaxed Florentine vacation. 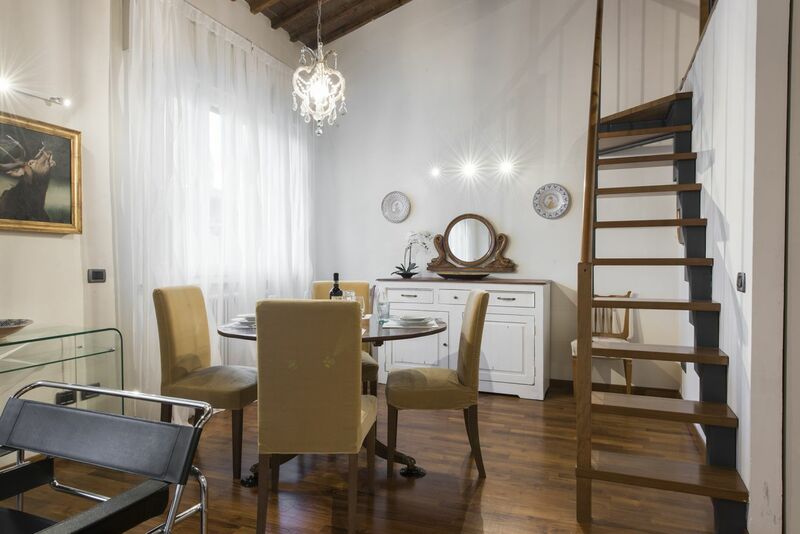 You can’t go wrong with a place as versatile and charming as this one!